LaHood's latest attempt to revise the rules of the road in response to hysterical fears about in-car technology is nothing new. The proliferation of the cellular phone in the late 1990s was met with a similar response, as was the advent of the car phone in the preceding decade. In fact, the state's attempt to engineer the ideal driving experience-during which the automobilist's hands are always at 10 and 2, his eyes glued to the road, his ears pricked only for the sounds of emergency vehicles and the laughter of children bouncing their balls too close to the street-dates back to 1930s Massachusetts, and a man named George A. Parker. The Automobile Legal Association, an industry lobbying group, objected to both pieces of legislation, on the grounds that "speeding and indifferent driving"-two of the biggest causes of accidents-"could not be eliminated by tests." 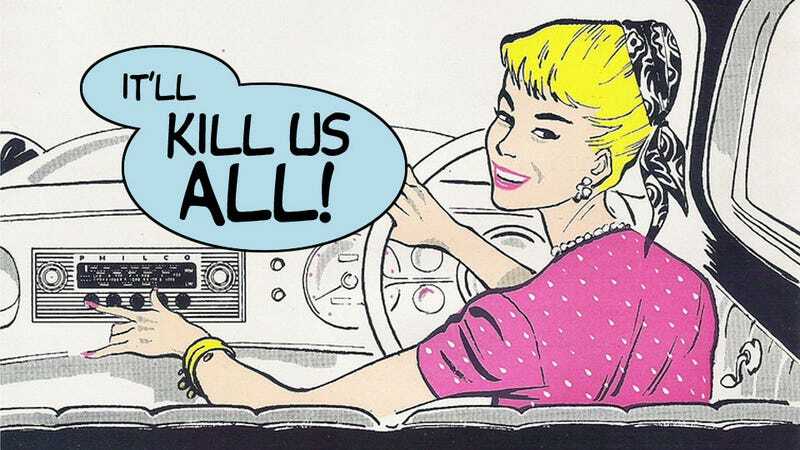 "Pictures were drawn before the Department of Public Works depicting the automobilist on a long trip soothed by the swing of a serenade pouring from the mouth of a loud speaker, while the ‘back seat' driver clamored vainly for an audience," reported the Christian Science Monitor. Also featured: "The habitual speedster, crawling at a snail's pace along the highway, lest he lose the last minutes of ‘Amons ‘n' Andy'" and the driver "who usually falls asleep at the wheel, pictured wide awake keeping time to the strains of the ‘Beautiful Blue Danube.'" Colby rebutted Parker again in May of 1930, this time in the pages of The Washington Post. His list of defenses holds true today: Radio is not in "the class with the back seat driver with his or her irritating remarks, nor can the radio set carry on an argument with the driver." The radio knob is as easy to use as "a choke handle." Driving without even the slightest distraction can be monotonous and sleep-inducing. Insurance companies-"always quick to sense a risk or liability"-"see nothing unsafe in motor car radio." Ray LaHood could learn a thing or two from Parker's failures. For starters, American drivers are no more willing to part with their in-car technology in 2012 than they were in 1930. Banning cell phones has only moved their usage from steering wheel level-where one could divide his attention between the phone screen and the road-to the driver's lap, increasing the distance one's eyes must travel from text message to tarmac. The other lesson, of course, is that technology is here to help. GPS simplifies the driving experience by eliminating the need for solo automobilists to reference paper maps while driving. And those textureless (and therefore "distracting") touch-screen buttons that were so pervasive in 2011 baseline models? Come next year, or maybe the year after, their functions will likely be handled by voice activation technology (or maybe, the cars will drive themselves). Until then, American drivers will continue to adjust to in-car features, just as they learned, almost a century ago, to hunt down Amos 'n' Andy on the AM dial while chugging along in their Studebaker Phaeton's and Ford Model As-without crashing. This story originally appeared on Reason.com on March 2nd, 2011, and was republished with permission. Look for it in Reason magazine.